Laguna Beach has a soft spot for its furry friends, providing a home base for several nonprofits that rescue sick and abandoned pets and wild critters. 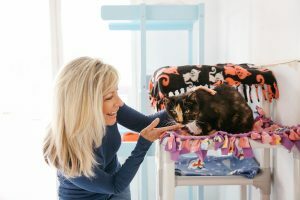 Nestled in Laguna Canyon, three organizations are working hard to help animals—from dogs to cats, sea lions and more. 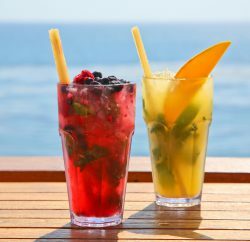 Located within a half mile of each other, the Laguna Beach Animal Shelter, Pacific Marine Mammal Center and The Blue Bell Foundation for Cats are all making a difference, fueled in large part by community donations and dedicated volunteers in this town, which is known for its generous spirit and support for a variety of causes—including creatures both great and small. Inside the blue-trimmed white cottage run by The Blue Bell Foundation for Cats, a few felines laze about in the sun on a window seat covered with pillows, while others nap on a bunk bed or stroll out to one of three screened-in porches that provide the perfect place for watching birds and butterflies outside. Toys, perches and scratching posts also keep the furry residents entertained. This cozy setting is home to about 50 senior cats—most age 10 and up—whose owners have passed away or can no longer care for them. Pamela Knudsen began her work at Blue Bell as a cat cuddler before taking on more responsibilities. The cottage provides a home-like environment for these felines to spend the rest of their lives. It was founded in the 1960s by Bertha Gray Yergat, who opened her residence (the same cottage used today) as a boarding center for cats whose owners were traveling and a sanctuary for both strays and cats belonging to friends who grew too frail or ill to keep their pets. 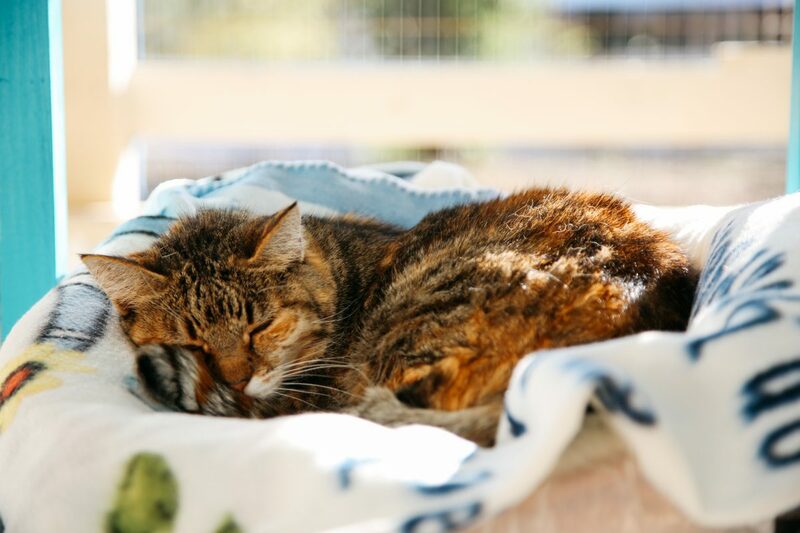 As Yergat herself became elderly and her health began to decline, she established the nonprofit foundation—named after her favorite feline, whose collar sported a blue bell—in 1987 to ensure that this refuge would continue. At that point, she was looking after approximately 200 cats. While other groups focus on adopting out the animals they rescue, Blue Bell provides a permanent home for the cats entrusted to its care—often in the wills of their owners. A fee of $7,500 is charged per cat, which covers lifetime care, although costs can often exceed that amount due to medical treatments that may be needed along the way; donations help make up the difference. However, the organization also accepts unadoptable cats from Laguna Beach, and in situations—on a case-by-case basis—where the fee cannot be paid; Blue Bell’s Community Cat Fund, bolstered through donations and fundraisers, helps support these types of situations. Volunteers are also integral to the operation. While seven staff members make sure the animals are fed, medication administered, the litter pans emptied and linens laundered, about 20 active volunteers come in on a regular basis to cuddle and play with the cats or help plan the annual Cat’s Meow, a Champagne brunch fundraiser gala. For Blue Bell’s staff and volunteers, much of the work is challenging—including helping new sanctuary residents adjust. Some of the cats are skittish when they arrive to this new place, not understanding where their longtime owner went. Sometimes, they won’t let anyone come near them and may even hiss or swipe their paws at strangers. They are kept in a separate, smaller building, along with those being treated for medical conditions, until they acclimate. With lots of effort by the staff and volunteers to slowly gain the animals’ trust, the cats usually warm up to people. “To see them come out of their shell … that’s rewarding,” Knudsen says. One such success story is Star, who arrived at Blue Bell in 2010 when her owner moved to an assisted care facility. At first, Star was aggressive and guarded, staying in her cat tree cubby inside an enclosure in the smaller building. She wouldn’t allow anyone to touch her. After volunteers spent lots of time sitting in the area and sweet-talking her, Star eventually came around. She is now quite social, seeks attention and can be picked up and petted, Knudsen says. Rehabilitated sea lions are released Pacific Marine Mammal Center. Looking to continue this kind of work into the future, a three-year fundraising campaign is now underway to complete a $50,000 themed garden project, bolster the endowment for animal care by another $50,000 and renovate Orange County’s first retirement sanctuary for cats, at a cost of $200,000; the aging cottage, circa 1941, would be upgraded by adding air conditioning, elements for better energy efficiency and more—all in the name of making senior felines, who wouldn’t otherwise have a home, more comfortable during their remaining years. When Keith Matassa gets bogged down in the drudgery of paperwork, he can be found walking out to the second-floor balcony at the Pacific Marine Mammal Center (PMMC) to watch the seals and sea lions slide and play on concrete that’s been wetted down around their pools. The sight reinspires the nonprofit’s executive director, reminding him of the reason for his work. And it is a lot of work: The number of sick, injured and stranded animals receiving care at the center has climbed in recent years—372 in 2013, 257 in 2014, 584 in 2015 and 319 in 2016 (as of late October). The spike was due, in part, to warmer waters shifting where prey could be found, forcing sea lions to leave their pups for longer stretches as they searched farther and deeper for food. “So the pups were just sitting on the beach, waiting for mom to come back,” Matassa explains. For some, mom never returned. For others, mom was producing less milk because she couldn’t find enough food. This led to pups, many weighing less than they did at birth, becoming weak and stranded. Even with the surge in rescue numbers, the PMMC forges ahead with its mission to help animals as it has for 45 years, thanks to the commitment of a small paid staff and about 160 volunteers that can be called on as needed. 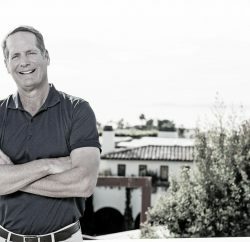 The center, which was the first marine mammal rehabilitation facility in the state, began in 1971 as Friends of the Sea Lion with only three volunteers, lifeguards Jim Stauffer and John Cunningham, who was also a teacher at Laguna Beach High School, as well as Dr. Rose Ekeberg, a local veterinarian. Matassa has led the center since 2013. “I’ve loved every minute of it,” he says. 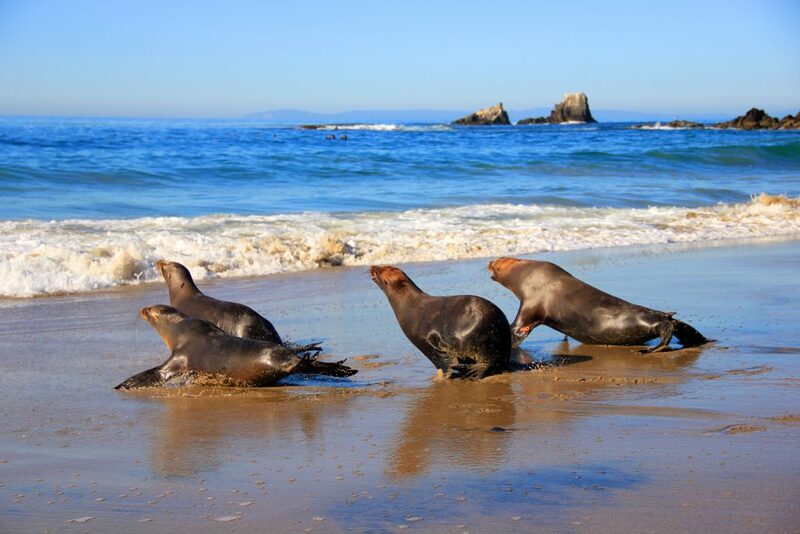 Matassa’s favorite part is working with the dedicated and caring people and “watching the seals and sea lions we release,” which caps an emotional and oftentimes difficult journey of recovery. “They come in pretty much on their last leg,” he adds. Matassa recalls a big sea lion named Bruce, who arrived at the center in 2014 after being bitten by a great white shark across his chest. After treatment for about a month, Bruce made a full recovery and was released back into the ocean. On average, pinnipeds stay at the center for two to four months. Species that receive treatment at the PMMC include California sea lions, elephant seals, harbor seals and fur seals that are starving, injured, diseased, stranded or become entangled in fishing gear. The center covers 52 miles of coast along Orange County, assisting centers in other regions when requested. This fall, Matassa is gearing up for the heavy rescue season that typically runs from April to June. While numbers have been on the low side so far this year, he knows it will be a busy season if there’s an uptick in rescues by early December. Matassa is also busy working with the city on proposed additions to the center, including three new pools, a necropsy room, expanded educational area—7,000 to 9,000 children go through the center’s instructional programs each year—and a water reclamation system to reduce water usage by 85 to 90 percent. Matassa says he tries to make the center a good environmental steward, adding solar panels, a garden of native plants that need little water and patio furniture made from recycled materials. Environmental protection is part of the center’s message—in addition to teaching about marine mammals—and the message is present in tours, field trips and after-school programs. Since it was established in the 1970s, the Laguna Beach Animal Shelter has provided temporary housing and care for sick, injured, stray or abandoned dogs, cats and, occasionally, pigs, rabbits, birds, chickens and reptiles. Even a llama and kangaroo have come through the animal shelter—the only one operated by a city police department in Orange County. The shelter is funded by the city, but also receives contributions collected by a nonprofit called Protecting Unwanted Pets (PUP), its fundraising arm. The shelter also has been the beneficiary of several large donations in the wills and estates of community members, who had a soft spot in their heart for the shelter’s work. “Residents of Laguna Beach have been very generous over the years with their donations and gifts,” says Jim Beres, the police department’s civilian services administrator, who oversees the Animal Services Division. Notably, PUP began as The Pet Responsibility Committee, a volunteer group that convinced the city to buy the American Society for the Prevention of Cruelty to Animals’ former building and open the local animal shelter there. 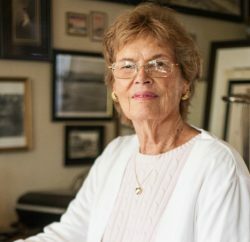 Nancy Goodwin has been the shelter manager since 1980. She oversees a staff of three part-time and three full-time workers, as well as a team of 35 to 45 volunteers who are integral to the operation, helping to clean, answer phones, walk dogs and assist people with adoption applications. “It couldn’t exist without the volunteers,” Goodwin says. The shelter is indeed a busy place: In 2014, the latest year for which numbers are available, 140 dogs, 35 cats and 17 other creatures were impounded. 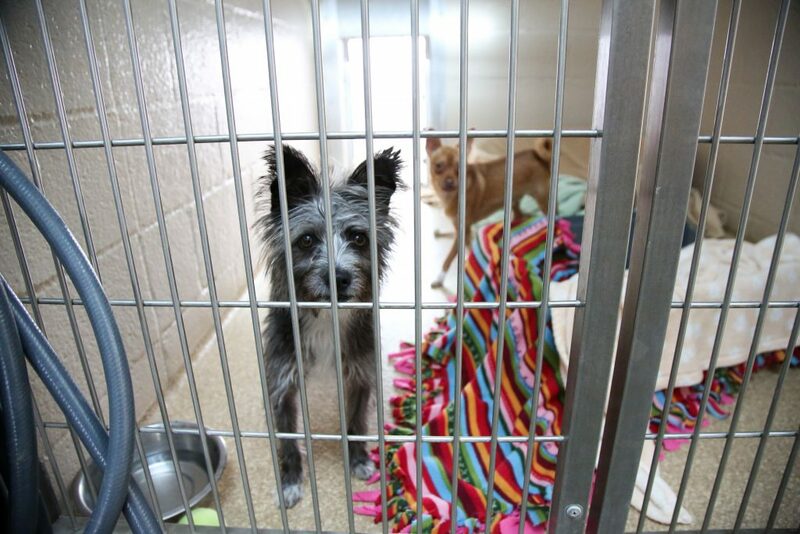 Of those, 93 dogs and 10 cats were claimed by their owners, while 48 dogs and 24 cats were adopted. The shelter boasts a high claim rate and doesn’t euthanize animals due to lack of space, only to prevent suffering from injury or disease, or for behavioral issues that make the animal unadoptable—like if a dog has bitten a child, according to Beres. The agency’s primary focus is to find a permanent home for the animals. “Our goal is to try to get them adopted as quickly as possible,” Beres says. Over the years, Goodwin says the shelter has seen a shift from large dogs to smaller ones, like Chihuahuas, as well as an influx of animals from the local population of homeless men and women. Many dogs and cats are waiting for their forever homes and would make great pets. Walking by the large cages—which include indoor space with air conditioning installed earlier this year with donor funding and access to an outdoor area with heated floors—the animals are eager for attention. One little, black dog (possibly a poodle mix) that has captivated the staff is named Project, due to his many medical issues. He came to the shelter during the summer from a rescue group in Mexico and arrived with mange and no bone in one leg, requiring surgery to insert a metal plate. “He’s a great little dog,” Goodwin says, adding that one volunteer has already signed up to adopt him. In addition to potential pets, the shelter offers low-cost vaccinations and spay/neuter surgeries as well as a bevy of information on training and housebreaking for owners struggling with their pets’ behavioral problems. An adoption at the Laguna Animal Shelter. The shelter was remodeled following the 2010 canyon flooding that caused much damage, and expansion options are now being considered, such as making the cat section bigger; this is one area that’s strained for space. Off-site satellite locations are among the proposals, or a building may be constructed above the parking area. Goodwin says an elevated area would be ideal in case it floods again. As she says, “It would be nice to put the animals where you know they’re going to be safe at night.” Although, in the meantime, the shelter remains a haven, run by good-hearted staff members and volunteers who are dedicated to the selfless task of caring for abandoned animals. 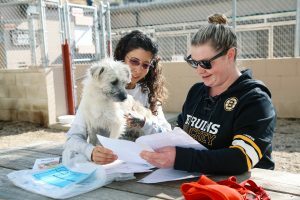 From donating money and supplies to volunteering in a variety of capacities, here are a few ways to get involved with organizations helping animals in the area. Attend the annual Cat’s Meow, a Champagne brunch fundraiser in February. Volunteer as a cat cuddler to spend time with the animals or help with fundraising, administrative tasks, event planning and public relations. Contribute money to the foundation through its website, bluebellcats.org, with the option to earmark funds for cat care or the garden or renovation projects. Donate cat toys, blankets, unopened cat food and cat scratchers (made of corrugated cardboard only). Volunteer to help with animal care or education efforts, serve as a tour docent or work in the gift shop. Attend the annual gala, which has been called Marine Mammal Gala and Treasures Under the Sea, in September, and Martini Madness in May. Donate money on the center’s website, pacificmmc.org, or send a Target or Amazon gift card to the center to buy supplies; this is more convenient for the center than donating items, which must be stored until needed. Purchase presents in the center’s gift shop or through the holiday catalog, online at pacificmmc.org/2016catalog. Buy a brick, starting at $150, on the center’s walkway and have it engraved in memory of a loved one. Teachers may sign up their classes to participate in the Change the Life of a Seal program through May 1. Students collect spare change for the center, earn prizes from pencils to T-shirts and have the opportunity to attend the release of a rehabilitated sea lion. Contribute money through the nonprofit Protecting Unwanted Pets’ website, puplagunabeach.org. Donate towels, blankets, dog beds, food and treats. If the food isn’t used at the shelter (abruptly changing the animals’ diets can cause digestion problems), it’s donated to places with few resources like shelters out in the desert. Volunteer at the shelter to help bathe and socialize the animals, walk dogs, answer phones and assist with pet adoption applications.